Looking for lunch in Falmouth? Our all day dining menu is served from midday until 9pm every Monday to Saturday, and from 3pm until 9pm every Sunday. Revel in the best of what Cornwall’s larder has to offer, whipped up with skill and served with a smile. Choose to join us for food in either our relaxed bar area or award-winning restaurant. Enjoy free parking onsite, arrive by boat and moor up on our private pontoons, or find us via a short stroll from Falmouth town. 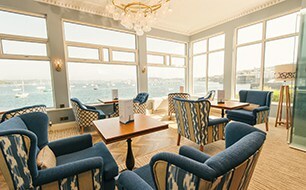 Whether it’s indulging in a steak sandwich bursting with flavour, tucking into sweet treats in the hazy sunshine, or sipping a cappuccino whilst surveying the calm waters of Falmouth bay – launch into long lazy dining, the Greenbank way. Please highlight your dietary requirements to our team. For allergen advice correlating to our number system, please click here. Served daily from midday until 6pm. A smooth mellow mould-ripened soft cheese with a subtle aroma and delicate velvety rind. Award-winning vegetarian pasteurised cow’s milk blue cheese. Gorgonzola in style, mild and creamy with a dense texture. A strong yet well-rounded flavour with a slight crunch and a crystalline appearance. We want our younger diners to experience the Water’s Edge menu with you, which is why we have half portions available at half the price. Please note the available dishes have a ‘K’ on the main menu. We also offer freshly prepared favourites, all served with rustic fries, cherry tomatoes and cucumber sticks. 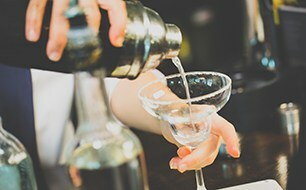 Head to the bar and sip an expertly mixed cocktail, sample our extensive wine and spirit selection, or refresh with an ice-old beer on the terrace. Perhaps a bottle of fizz to celebrate? Our friendly team are on hand to serve up your perfect drink. Whether you want to read, chat or just daydream as you watch life on the water's edge, here you can kick back in a soft comfy chair and relax. Our spacious lounge bar with classic styling quickly adapts to your mood. Grab coffee and cake with friends, work a while with our free WiFi, or chill with a cocktail or two. Friday night in Falmouth is cocktail night at The Greenbank bar. Enjoy two cocktails for 10 every Friday from 5pm until close. 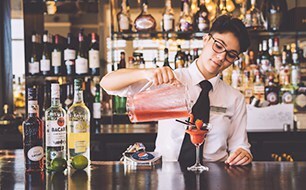 Join us for a sultry Strawberry Daiquiri, cool Cosmopolitan or sophisticated Espresso Nutini whilst drinking in the panoramic views over Falmouth harbour.